X-100 Natural Seal® Roof Grade is an oil based, penetrating water repellant for application to split or sawn cedar shake shingles. X-100 Natural Seal® Roof Grade is an oil based, penetrating water repellant for application to split or sawn cedar shake shingles. X-100 Natural Seal® Roof Grade is designed to penetrate the wood, protecting against cracking, splitting, cupping, curling, sap stain, mold and mildew and against the environmental forces of wind, rain, snow, ice and sun. X-100 Natural Seal® Roof Grade is V.O.C. compliant and is available in transparent and semitransparent stains. 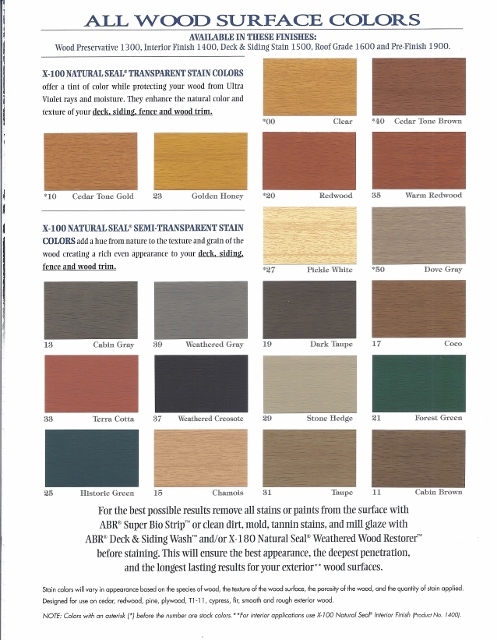 **Call to inquire about colors for Roof Grade, only clear, cedar tone gold, and cedar tone brown are available. 75-150 sq. ft. per gallon, depending on porosity of surface. Less than 250 grams per liter VOC. Five and fifty-five gallon containers. absolutely dry and in good condition. Do not apply when air or surface temperature is below 50ºF. Do not apply over wet or damp surfaces or when rain is imminent. Do not apply over previously painted or sealed surfaces, metal, masonry or to fresh stucco. Do not thin this product. Not intended for interior use. For exterior use only. Super Bio Strip™ or other, appropriate ABRP, Inc.
the stain, nor does it indicate stain failure. material in case of overspray. 1. Mix X-100 Natural Seal® Roof Grade well before using. Apply with a brush or low pressure sprayer. 2. 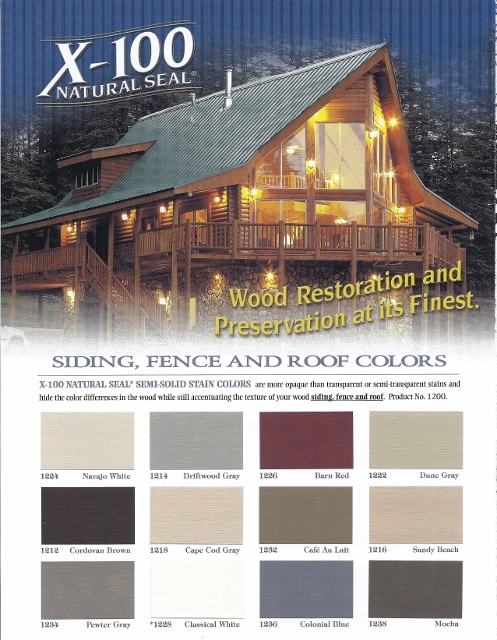 Apply as much X-100 Natural Seal® Roof Grade as the wood will absorb. Use mineral spirits or dish detergent and water. 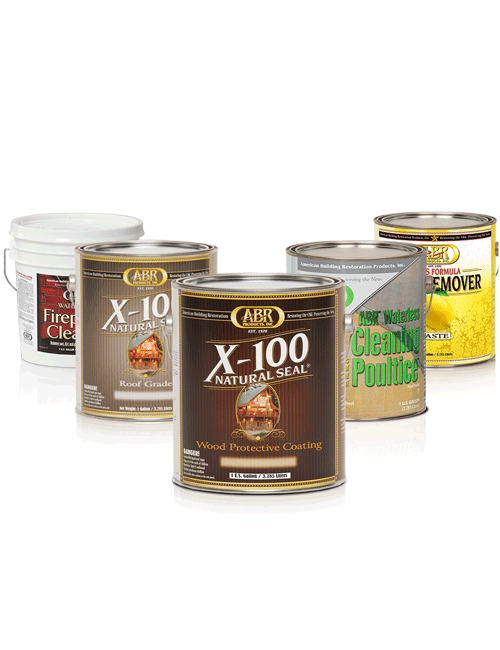 If X-100 Natural Seal® Roof Grade should get on surfaces such as glass, paint, metal, caulking or rubber, remove immediately with dish detergent. If a spill is dry, clean with mineral spirits. Keep container closed when not in use. Store in a cool place. This product should be kept out of reach of children and stored away from food. Do not reuse empty can. Wrap can and place in trash. Leaking or damaged containers should be placed in a plastic bag and discarded. Contact local, state or federal agencies to ensure compliance of proper disposal methods and respective regulations.